Steven Long is a triple threat. He is an editor, journalist, and humanitarian most famous for his books on some of the most sensational true crime events in the nation. He has spent more than 2,000 hours in the courtroom, more time than most practicing lawyers spend there in a lifetime. He has covered some of the most important cases of the last two decades. Few can capture the drama of lawyer vs. lawyer quite like him. Now he takes his immense talent for narrative to the pages of fiction with his new novel Ruby’s Passing, a worthy successor to his bestsellers, Death Without Dignity, Out of Control, and Every Woman’s Nightmare. Long began his career in radio but quickly moved to print. For most of 11 years, he served as editor and publisher of Galveston’s In Between Magazine, an award-winning alternative weekly famed for its gritty investigative work. His first freelance piece appeared in the respected Texas Observer. In the 1982 Texas election for governor, Steven Long asked the incumbent, Bill Clements, a question that changed the state’s history. “Would you appoint a consumer, for example, a housewife, to the Texas Public Utilities Commission?” The governor blundered and answered, “There isn’t a housewife in Texas qualified to serve on the PUC.” He lost the election. After closing In Between, Steven Long carved out a career as a feature writer with the Houston Chronicle. One article resulted in the indictment, conviction and disbarment of the late Houston adoption lawyer Leslie Thacker for buying and selling crack babies in several Texas county jails. Another series of investigative stories ultimately resulted in the indictment and conviction of the head librarian of the oldest medical school west of the Mississippi for stealing rare and historic medical texts, some dating to the sixteenth century. He exposed the Texas prison system’s wholesale practice of allowing the use of inmates as subjects for medical residents to hone their skills in cosmetic surgery at a state teaching hospital. Steven Long covered the Andrea Yates murder case for the New York Post from the scene to conviction. For the same paper, he found rogue CEO Ken Lay who hid for ten days when the Enron scandal broke. He covered the lengthy and complex trial of the Arthur Andersen accounting firm for Agence France Presse, as well as Crain’s Chicago Business. 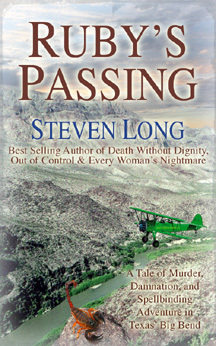 Steven Long is currently writing the prequel to Ruby’s Passing. It too is set in the storied badlands of Texas’ Big Bend country. The working title of the book is Sauceda. Steven and Vicki Long, a fiction writer, live in Houston, Texas. He serves as Vice President of The Greater Houston Horse Council. The two own Horseback Magazine and Horseback Online, the nation’s leading online newspaper covering the equine world. Next PostCrime Wire Examines Two Cold Cases: Do YOU Have a Clue?